A look at the romance and resurgence of this special space. 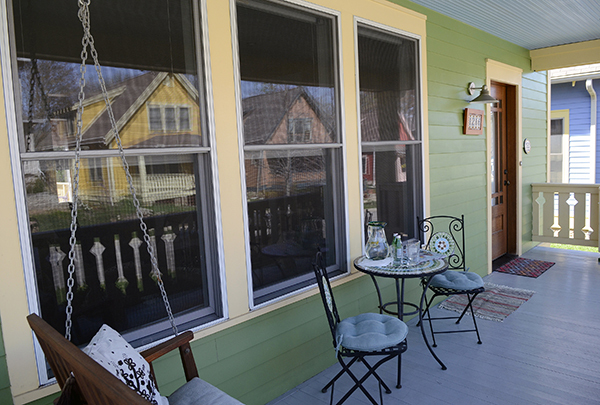 The Castanedas keep their porch ready for company with Spanish-influenced furnishings. /By Steph Langan. We sit on them to watch storms, to tell stories, to talk on the phone, to chat with our neighbors and to make memories with family. The romantic roots of the front porch run deep in Southern Indiana. While some consider the front porch a thing of the past -- a nostalgic piece of American architecture -- it's making a surprising comeback. "I suspect we're feeling nostalgic these days," says Philip Gulley, author of "Front Porch Tales" and owner of a vintage Orange County farmhouse, "and a bit overwhelmed with technology, which makes the peace and simplicity of the porch all the more appealing." We spoke with enthusiasts about their distinctly Southern Indiana porches. You'll meet a young family on their modern home's front steps, gather for hors d'oeuvres at a chef's rustic cabin and reminisce on a swing with two empty-nesters. With these porch lovers as our guides, we'll explore our love affair with front porches and why they're here to stay. "A porch is a state of mind." No matter the weather, when Ernesto Castaneda looks up, he sees blue. "With this winter we've had, with all of these gray skies, "I always wanted to have a blue sky," he says. "At least for a moment." That's why he painted his porch ceiling blue, a Southern tradition. When the weather mimics his paint job, he lies out on the expanse of wood with his son Max. They peek beyond the roof at the sky and trace the shapes of clouds together. Castaneda smiles at the memory. "He loves that, you know? He's almost 6, and he still loves that." When Castaneda purchased his traditional, 1920's-bugalow-vibe home on South Dunn Street, he picked the color palette -- a vibrant green and yellow, although he was leaning toward aqua for some time -- and decided which trees to plant along the road. He was an architect with the South Dunn Street housing project, which began in 2003. Castaneda says the neighborhood was all about living "smaller" and "new urbanism." "The reality is, there's nothing new about it," Castaneda says. "We're just trying to bring back the good things that were done back in the early '20s. Community is what is important." Castaneda can sit on his porch and talk to his neighbor across the way because the streets are so narrow. The landscaping, the houses, the shops, the streets and the sidewalks make a community, and porches are a part of that. "It's just like a recipe when you're cooking," he says. "You could have all the ingredients, but if you don't put one in right, the dish isn't going to come out right." Castaneda gestures to a small notebook where he's sketched a floor plan for a client. Porches must be deep enough and wide enough to fit furniture -- especially a swing, he says. "A porch without a swing is just not a porch." His porch, naturally, has a swing. It also has chairs, a table, baskets of flowers hanging from the edge of the balcony and a 15-year-old chocolate lab named Frida, who has a "hug me" face. She likes to pad onto the porch in the early hours when the morning sun hits and lie in the patch of warm light. He looks forward to summer, and when fall rolls around, he and Max will camp out on the porch. "He might not last the entire night, but the intention is there. "Building memories, I think, is a good thing. And you can do that on the porch," he says. His daughter Eloisa is just an infant, but she should be walking in the summertime, during prime porch weather. Castaneda will dig in the garden, and his wife Angela will be right behind him planting flowers. "You can make it as romanticized as you want," Castaneda says, "but you build your own story." "We love our front porch. We have taken 26 years worth of family photos out there." It was where they met. It's been there for first days of school, proms and birthdays. It has seen neighbor kids grow up and housed a happily creaky swing for 26 years. Bill Ohlendorf, 63, swears he has greased the springs and chains on the swing that has hung on their front porch since they moved into their turn-of-the-century home in Madison in 1988. Susan Ohlendorf, 60, swears she's never sat on the swing without it calling out that comforting creak. together as kids on his family's porch in Louisville. Susan remembers hearing Bill's mother strum her ukulele for them, playing chess on tea tables and having a "secret crush" on Bill at an early age. That secret turned into a happy marriage and family. Bill and Susan bought the home to provide more space for themselves and their daughters, Marybeth and TJ. It came as no surprise when they put in an offer on a house with a great front porch. They remember walking around Madison looking for new houses and seeing their current home's previous owners sitting out front. "It definitely was one of the things that attracted me to it," Susan says. The porch soon became a family favorite, welcoming guests at family get-togethers, neighbor kids during play dates, and family members for gatherings. TJ and Marybeth, now 38 and 29, have moved away, but they still consider the porch one of their favorite parts of the house. TJ liked to sit out on the swing during thunderstorms, feeling the breeze and listening to the thunder while sheltered from the rain. She still loves being welcomed home on the porch by Susan, Bill and their German shepherd Shelby. Marybeth remembers sitting out on the swing with friends and hopes to have a porch like her parents' someday. "It really is more of a community porch than a family porch," Susan says. Her daughters' neighborhood friends came over to play as kids, hung out as teenagers and now catch up as adults. Susan says that so many of their family's memories are there: when Bill tried rollerblades for the first time, when a neighborhood kid was found napping there, when her girls would put on their own productions of plays there. Now that Susan and Bill are retired, life has slowed down a bit. They use the porch as a place to phone family and friends, to photograph the changing seasons, to read and to watch the dog. The porch is a comfortable place to come home to, to relax and recharge after their busy days. Just as they used to glide with their girls on that wooden porch swing, they now swing with grandsons Robby and Alex. Same old creaking, same old porch, and brand new memories. "Porches give you the opportunity to open yourself up and be better." Rustic Cabin -- Chef Daniel Orr's Southern Indiana cabin is 10 minutes away from his restaurant, but he says it's 2,000 miles away in feeling. In New York, where he used to work, he'd have to drive two or three hours to get that same effect. He describes his cabin home as a kind of tree house -- it has lots of windows and, when plants are in full bloom, everything is green. The home has it all -- a sleeping loft, an open-air floor plan, a two-story fireplace and a wraparound terrace. But the first thing a visitor sees is the porch. Orr's porch is the most traditional feature of his home, he says. The rest is a "mix of new cutting-edge, with a mid-century modern feel," but out front, it's is old-timey and folksy. There's antique wicker furniture, a myriad of plants that Orr grew himself and a huge pile of firewood -- chopping it is one of Orr's preferred front porch pastimes. "It's a place where you can really decompress after a 12-hour day at the restaurant," he says. Orr hails from Columbus, Indiana, left home for college and didn't come back until he was an adult. "I ran away from home for about 25 years. I was in New York City, Europe for three years, the Caribbean..." He came back around seven years ago because his father was ill and decided to open FARM, his restaurant on Kirkwood Avenue in Bloomington. Both sides of his family were farmers, and Orr says that influenced his decision to go into culinary arts. "Food was always important to our family," he says. "It's something that I found early on that I did well, and I grabbed onto it." His passion for food doesn't stay at work, though. "You really can use the porch as an area for entertaining," he says. "I like to do the moveable feast where you eat different courses in different areas of the house." Cocktails and hors d'oeuvres belong on the front porch. The screened-in back porch is home to wild game barbecue and grilled eggplant baba ghanoush. Eating outside used to be simpler for Orr; when he was a kid, he remembers his grandparents coming over and drinking ice tea or lemonade on hot days, breaking beans and playing checkers and backgammon. That's what the porch is for, he says, to play games and kibitz with your family, friends and neighbors. "I wanted to create that old feeling of what the porch was meant for." He says porches foster community and notes that people who have porches tend to have more friends. Orr's porch has an iPod dock and WiFi accessibility, but he insists on keeping the old-time charm. Every porch needs the simplicity of a sleeping dog and a welcome mat to feel complete, he says. "That's what the porch does. It welcomes people into your space. It's like an extra room on your house." Orr has the welcome mat, but not the sleeping dog. Instead, he has a pair of 1-year-old twin tuxedo cats, Cooper and Conner. Orr cherishes his porch. Nowadays, he says, people have sidewalks that sidle right up to the front door. Guests don't have anywhere to wait for the homeowner to come and welcome them in. Without a porch, you have nowhere to watch the world go by. "It seems like we hide ourselves away," he says. "Porches give you the opportunity to open yourself up and be better." The front porch's popularity truly began in the mid 1800s, starting in the South due to the hotter temperatures. At this time, people had much more time for relaxation and leisure because they no longer had to be self-sufficient. A well-known landscape architect, Andrew Jackson Downing, believed the porch was a way for American architecture to set itself apart from English design. Everything from Colonial to Victorian style homes were being designed with front porches. The front porch acted as a go-between from the interior of the home and the world outside. It would be an escape from the heat within the house and a way to interact with the surrounding landscape. Gulley says porches serve an important function. "You're looking at the world passing by," he says, "and the world is looking at you. You exchange waves and treasure the connection." In the 1950s, WWII veterans began moving to single-family suburban homes with back yards, back decks and privacy. It wasn't until the 1980s that people began to embrace "small living" -- the idea that we don't need sprawling homes with too many rooms and instead are attracted to compact, practical living. Last year, more than 60 percent of houses built in the Midwest had porches. That figure has increased 50 percent since 1992. "We associate the porch with rest, renewal and relationships," he says. "When life is complex, those virtues get lost in the shuffle. The return to the porch is the collective way of saying, 'Slow down, world.'" Kathy Barajas, an Indiana interior designer, shared with 812 some of her top tips for sprucing up your outdoor living area for porch season. SEATING Every porch should have a couple of chairs. If you're strapped for space, replace them with a space-saving settee and some bright pillows. PLANTERS Put them on the floor or hang them from the edge of your porch if space is an issue, but always keep your planters filled to the brim -- to the point of almost overflowing. TABLES Small side tables set next to those chairs are the perfect spot for a porch staple -- your iced tea. DOORMAT A fresh new doormat goes a long way, and you can switch it out seasonally for some variation. COLOR Always add bold, bright pops of color. Vibrant colors can come in the forms of pillows, the doormat, furniture, plant containers, flowers or, better yet, all of the above.